As the 2012 Prius Plug-in models begin to arrive at dealerships, Toyota Motor Sales, Inc. announces that it has been approved for the State of California's Clean Vehicle Rebate Program (CVRP). The CVRP program offers rebates to individuals, business owners, non-profit groups, and government entities that purchase or lease new eligible zero-emission or plug-in hybrid electric vehicles. Under this program, the Prius Plug-in is eligible for a $1,500 rebate that will be provided to consumers on a first come first-served basis. These grants are available when a vehicle is either purchased or leased for 36 months or longer. The CVRP is funded by the California Air Resources Board (ARB). The first-ever Prius Plug-in Hybrid, combines the benefits of the third-generation Prius Liftback's Hybrid Synergy Drive with a dedicated electric driving (EV) capability, in a package that is priced more competitively than most currently available plug-in hybrids or pure Battery Electric Vehicles (BEV). 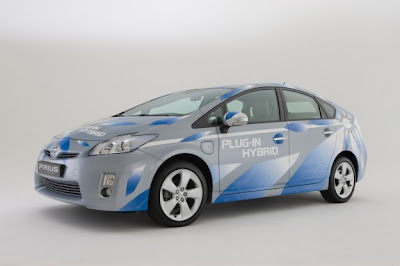 The Prius Plug-injoins the Prius Family, which includes the third-generation Prius Liftback, the versatile new Prius v and the all-new subcompact Prius c, which will be available in March of 2012. The Prius Plug-in features a new Lithium-ion battery, which boosts its overall fuel economy and offers convenient charging times of only 2.5-3 hours using a standard 120V outlet or 1.5 hours using 240V. While in EV Mode, the Prius Plug-in is rated by the EPA to drive up to 11 miles. It's also capable of traveling up to 62 mph using electric power alone. During EV Mode driving, the Prius Plug-in is rated at 95MPGe (miles per gallon equivalent). In hybrid mode, it has an EPA combined mileage rating of 50 mpg. This means that when the EV Mode is depleted, Prius Plug-in still obtains the same estimated high fuel economy rating as Prius Liftback. With its Lithium-ion power and extended electric vehicle mode, the Prius Plug-in is EPA-rated for a total driving range of 540 miles. It will be available in two models, the Prius Plug-in and the Prius Plug-in Advanced. The Prius Plug-in Hybrid model comes equipped with an abundance of standard features including LED Daytime Running Lights, Smart Key on three doors, Display Audio with Navigation and Entune™ with integrated backup camera, Touch Tracer Display, heated front seats, Remote Climate (A/C only), EV/ECO/POWER modes, unique15-inch 10-spoke alloy wheels, enhanced Multi-information Display and much more. The Prius Plug-in Advanced model adds additional standard features including Premium HDD Navigation with Entune™ and JBL® GreenEdge™, Plug-in Hybrid Applications through a user's smartphone (Charge Management, Remote Climate, Vehicle Finder, Charging Station Map², and ECO Dashboard²), Head-up Display, Dynamic Radar Cruise Control, Pre-Collision System, LED headlamps with auto on/off feature and integrated fog lamps, SofTex-trimmed seating, an eight-way power adjustable driver's seat, Safety Connect and more. The base MSRP for the Prius Plug-in Hybrid is $32,000. The Prius Plug-in Hybrid Advanced has an MSRP of $39,525. Both Prius Plug-in models are eligible for up to $4,000 worth of government-supported consumer incentives ($2,500 federal tax credit¹ and $1500 worth of the State of California's Clean Vehicle Rebate Program), in addition to offering eligibility for California's High Occupancy Vehicle (HOV) lane sticker. ² Charging Station Map and ECO Dashboard Apps available summer 2012; all other apps available at launch.